Super excited to be a part of my studio’s Holiday Sale this year! 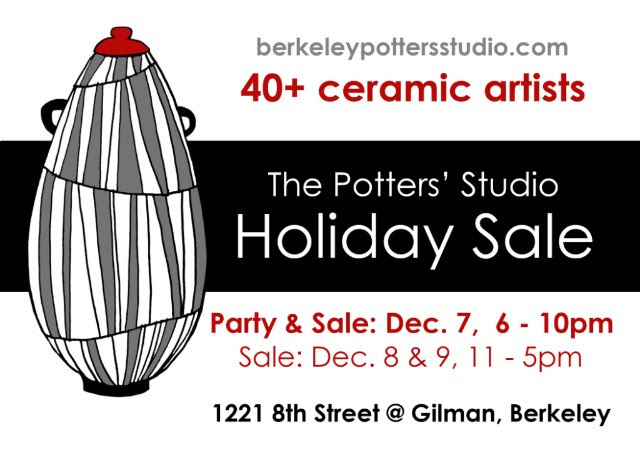 Over 40 ceramic artists from The Potters’ Studio will be selling work all weekend. Come check out the one of a kind pottery & ceramic art that is made in this wonderful space. Friday night 6-10pm will be the opening party with live music, food, & drinks! Saturday and Sunday, the sale continues from 11am-5pm. 1221 8th Street @ Gilman in Berkeley. 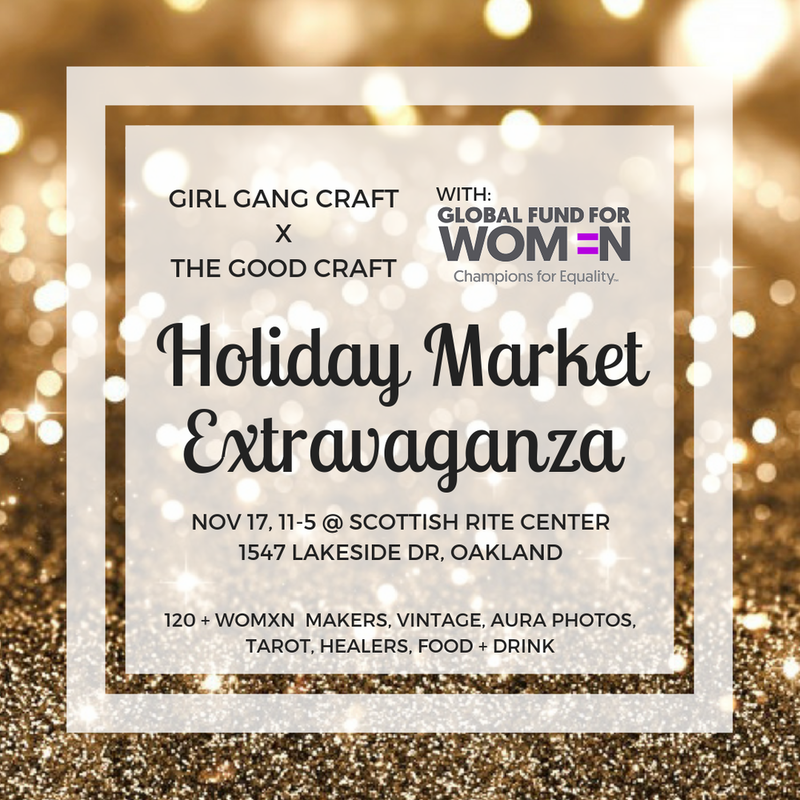 Girl Gang Craft and The Good Craft are teaming up for their biggest market yet. I’ll be selling work alongside 120+ local womxn artisans, makers, and healers. Check out the full roster here. for their work on human rights and striving for justice. SUPPORT LOCAL WOMXN & get your holiday shopping done early. Good Omen is my favorite market in the Bay! 60+ Makers! Food from Hella Vegan Eats! Sunshine! Tunes! Drinks! A percentage of proceeds will benefit The Crucible & their arts programming in Oakland. 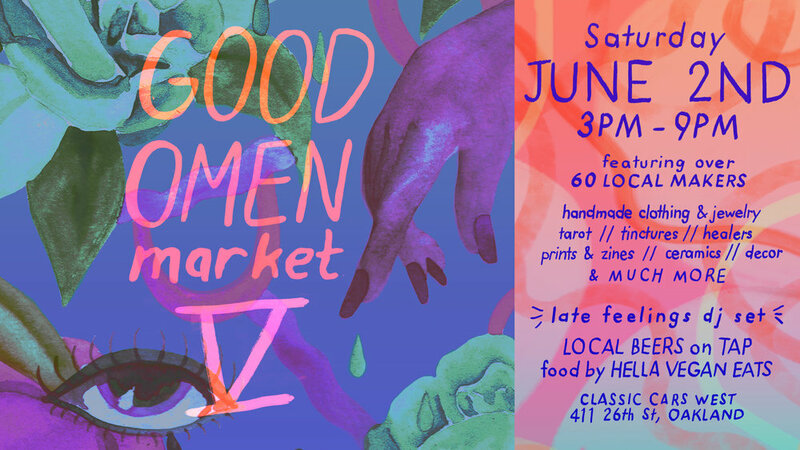 Excited to be a part of Good Omen Market V, along with over 60 local makers of clothing, jewelry, prints & zines, tarot, tinctures, ceramics, decor & more. Come Hang at Classic Cars West (411 26th St. Oakland) on Saturday, June 2 from 3-9pm ! Join us in celebration of Mother’s Day at Temescal Brewing! B.A.C.C. artists will be selling samples and seconds at discounted rates. with children who have experienced homelessness, violence, addiction, or poverty. Join us for our holiday pop-up market at Neyborly in Berkeley! which works on humane strategies to resolve unsanctioned encampments. a new community art space, gallery, & shop featuring the work of East Bay artists. Come say hi, check out the space, and pick up some locally made gifts for yourself or someone special! curated by Wallflower Vintage and hosted by Rejuvenation in Berkeley. 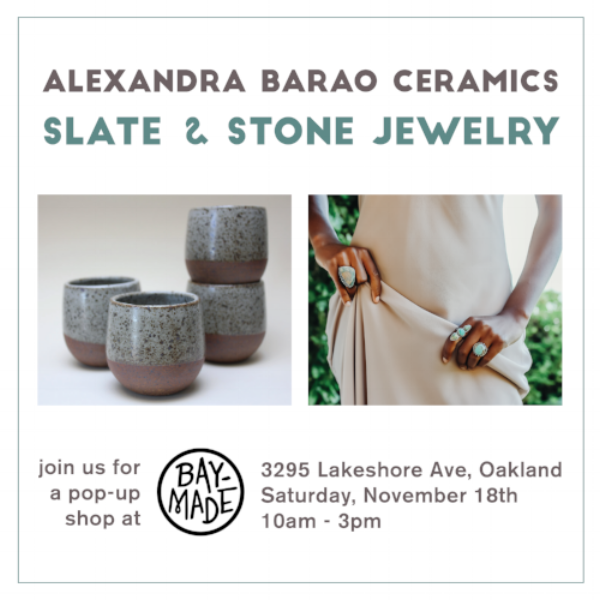 I'll be there selling work alongside Sophie of Slate & Stone Jewelry. Come check out our work and that of over 60 vendors of vintage and handmade goods! Come check out The Good Craft's pop up at Barebottle Brewery in Bernal Heights! Local artists, great beer, food trucks, and a portion of all proceeds to benefit Camp Common Ground. Curated market featuring vendors of vintage and handmade goods, presented by Wallflower Vintage and Rejuvenation. I'll be here selling work alongside Sophie of Slate & Stone Jewelry. happening on Sunday, Feb 26th at Starline Social Club in Oakland. For a donation of $40-100, attendees will receive a handmade bowl of their choosing and dinner. All proceeds will go to Planned Parenthood and the International Rescue Committee. Purchase tickets here. Thank you to Sarah Kersten for organizing! 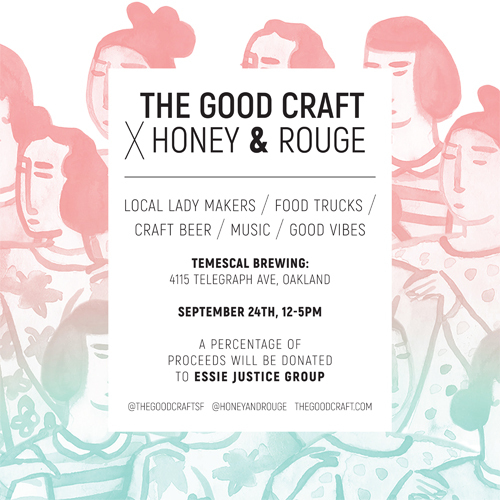 I'll be selling work alongside 20 other local artists with the Good Craft at Temescal Brewing. A portion of all proceeds to benefit The Nature Conservancy. Excited to participate in Temescal Brewing's first craft pop up event. Come by, have a delicious beer, and get some last-minute gifts for loved ones... or yourself! Celery Space, 1716 San Pablo Ave, Berkeley. I'll be selling work alongside twenty other local artists and makers at The Good Craft pop-up market at Celery Space in Berkeley. 10% of all proceeds from the event go to Black Lives Matter. I'll be selling work at The Good Craft pop up market at Cafe St. Jorge. 10% of all proceeds from the event go to St. Anthony's.